- If considered as things that can exhibit more design than pure function, creativity can expand. 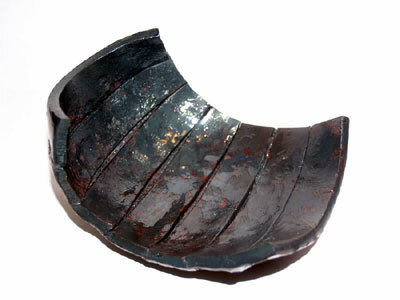 - These are large enough pieces that a wide number of forging and decorative techniques can be employed. - They are not so large or massive that they are (often) overwelmingly time consuming to make. - They also represent the kind of object that will be considered as much for their appearance as their end use. - Taken together, bowls and other containers become things to be treasured, but not so precious to make them beyond the reach of most. There is some attempt here to present pieces in chronological order.
" 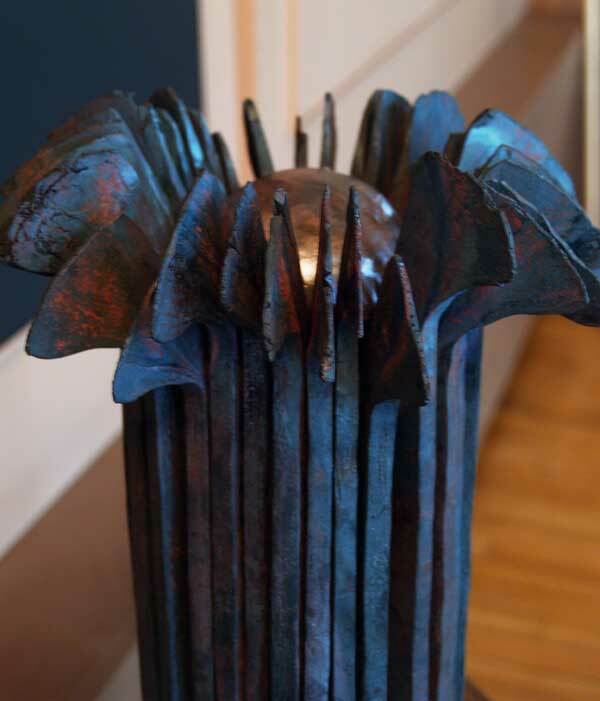 The body of the urn is composed of a number of individually hand forged strips of antique wrought iron. I saw samples of the basic technique employed by the Japanese blacksmith Takayoshi Komine at a workshop / demonstration two summers past. (Taka uses the method to make subtle oil lamps employed in the Tea Ceremony.) Actual historic wrought iron has been chosen for the construction because of its excellent forging characteristics and special durability. The metal itself is already some 150 years old — and should easily endure for centuries more. A fitting resting place for the memories of one past beyond us. " 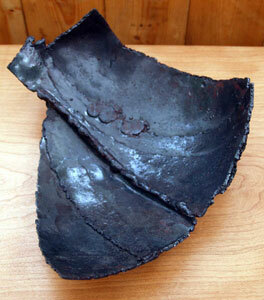 Offcut Bowl was created for the 'Shadowbox' show to benefit the South Grey-Bruce Literacy Council. 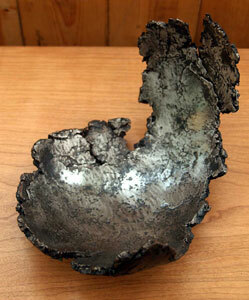 The object is about 10 x 10 in size, standing about 3 inches deep. The individual segments are in fact off cuts left over when I was cutting up some 1/8 inch thick plate I acquired as commercial scrap. 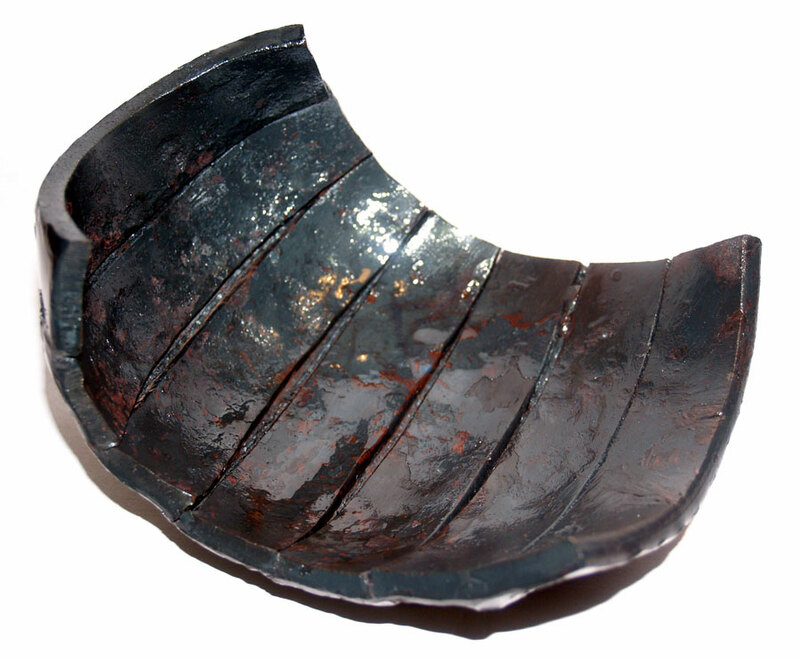 Taking a clue from a method used by Japanese artisan Takayoshi Komine, the individual segments were MIG welded together on the back, then the weld beads ground smooth. The resulting flat form was then worked hot to dish it. More details available on 'Hammered Out Bits'. Here a series of plates were rough cut with a torch. The individual plates are welded together, in this case with weld seams deliberately rough and applied on both the back, and visible top, surfaces. One of these seams was folded 'backwards' to create the ridge visible just off centre. Finally the attached surface was forged to the bowl shape. 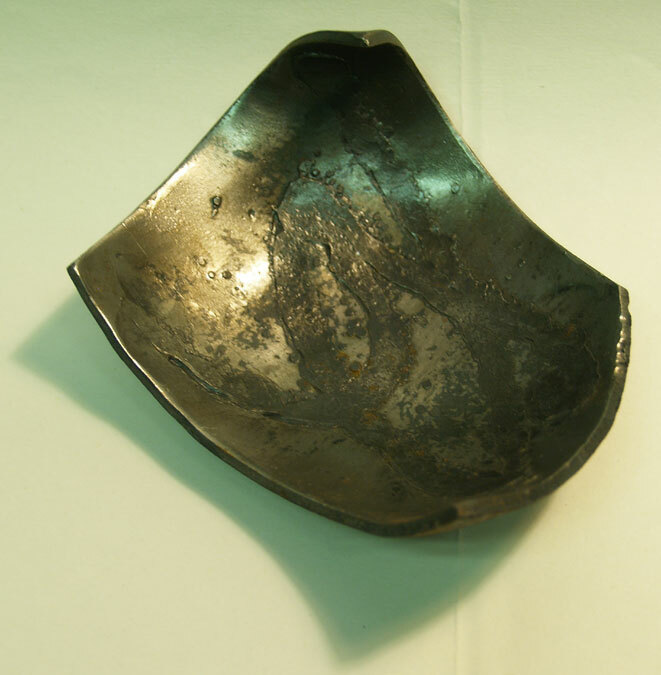 This smaller bowl is more true to the basic technique employed by the Japanese blacksmith Takayoshi Komin. A number of narrow but thick, uniform length bars are welded on the back and ground flush. 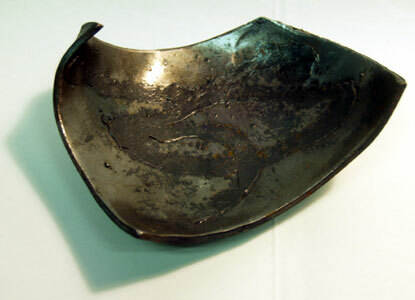 The plate thus produced is then heavily hot dished to create the bowl form. 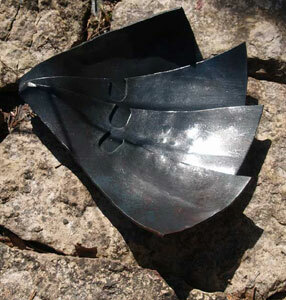 Again a series of narrow triangular shapes retain ragged edges from torch cutting. This piece served as a 'test of concept' for a new decoration method I had stumbled upon. Lines were laid on a piece of 1/8 inch thick steel plate. 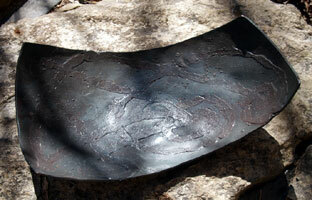 After forging flat, the plate was then dished using various rounding hammers and bottom forms. 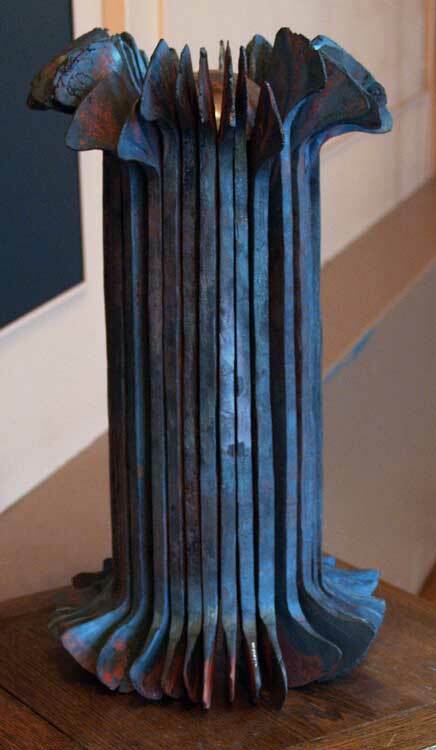 For this piece, the top surface was wire brushed, then sealed with satin varithane. The title is intended to be a kick back to those who 'put a knott on anything - then call it 'Celtic'. Continues the series. 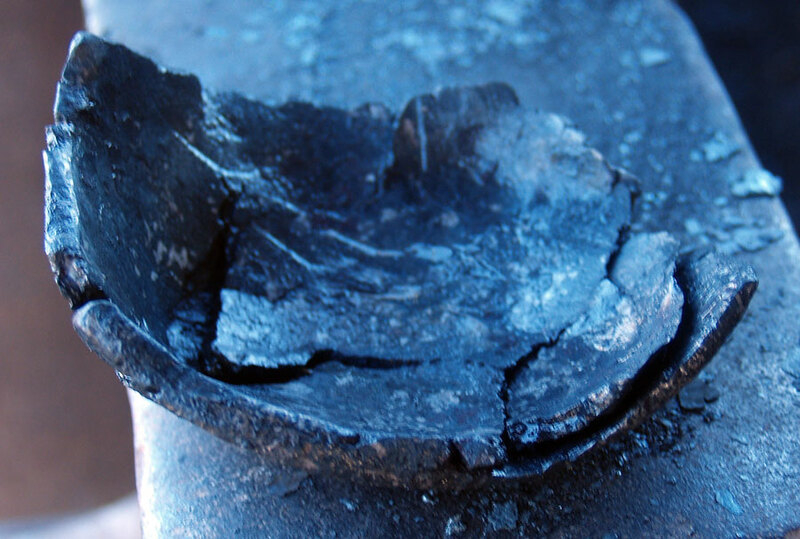 On this piece, the natural fire scale surface was left after forging, but still sealed with varithane for functional use. 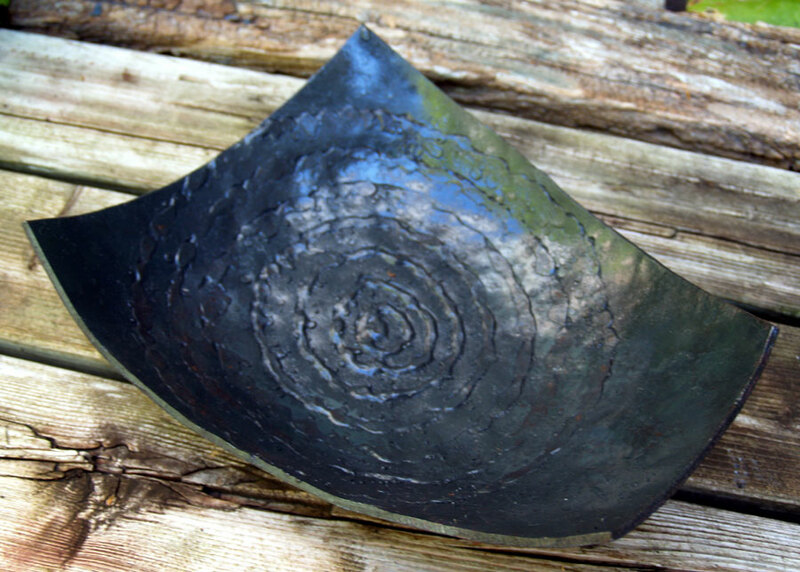 On this piece, the lines are laid as a 'starburst' pattern, radiating from one side of the original rectangular plate. The dishing process then echoed this, creating an offset oval form. There is a small flat sprial leg under the shallow side for support. The lines laid here are more random in pattern. The starting plate was a pronounced lens shape, with one edge rough cut by torch. 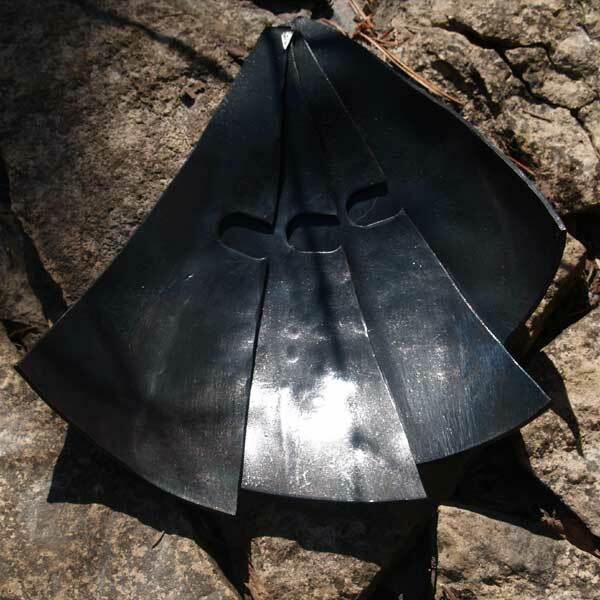 In the forging process, the shape created has a deep, flat bottom, the points curved under. 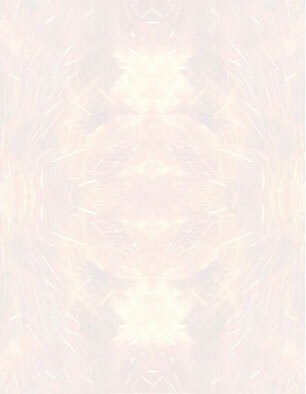 Another object using a regular 'starburst' pattern to the lines, here more symetrical. 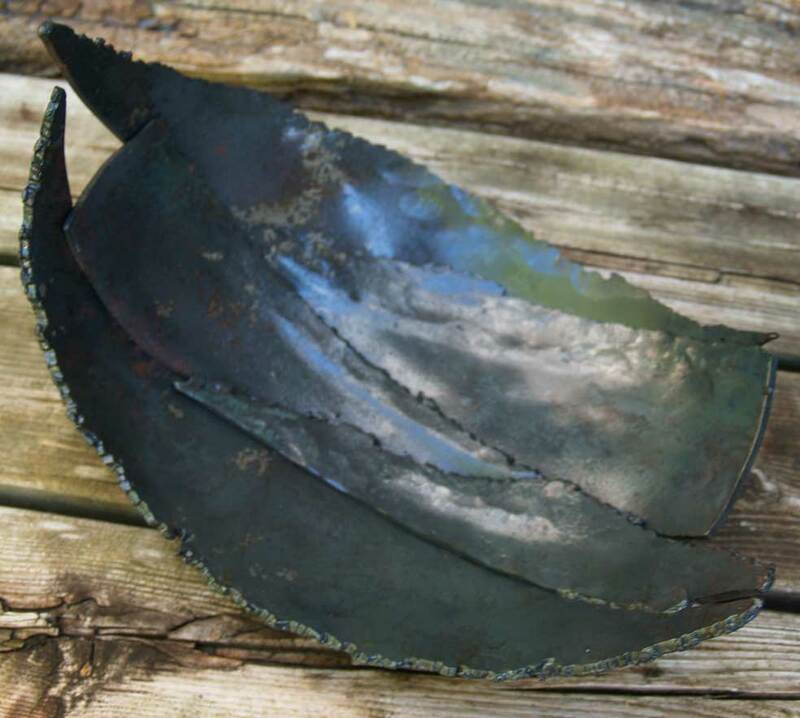 Also the use of a torch cut edge, but this time the ragged knotches smoothed before forging. The interior has been both dished in, and the bottom raised up slightly (ensuring a stable base). 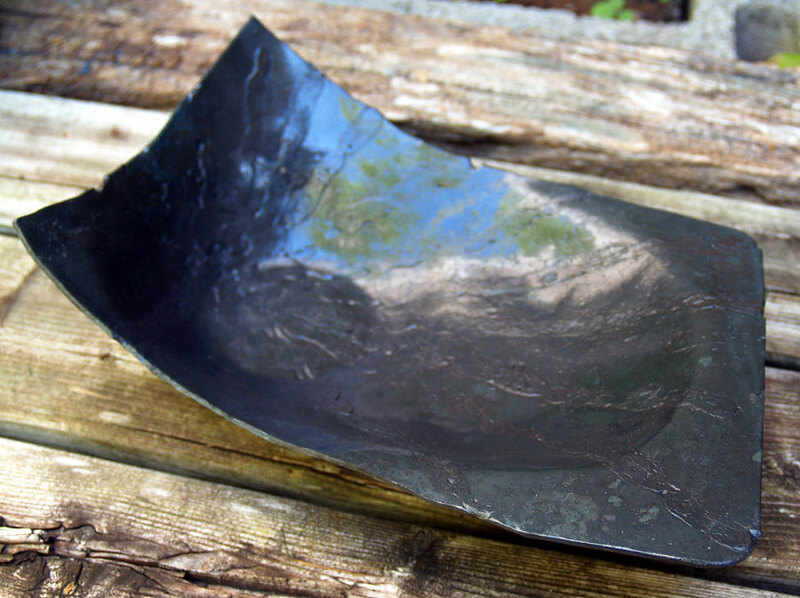 A number of elements within this series continues : torch cut edges, decorative lines flattened, dishing and raising plate. An extra addition here is the use of 'dry rub' paint. 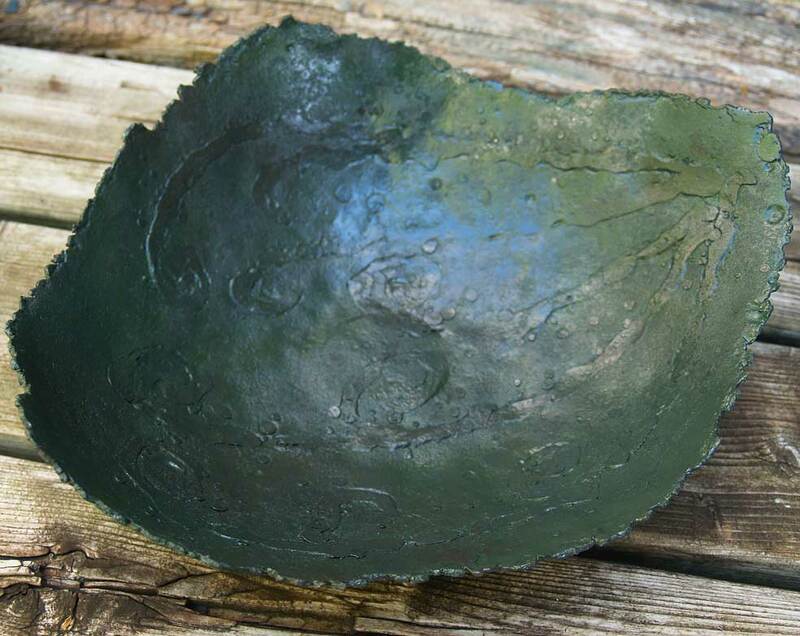 A dark green paint was rubbed over the textured surface, then wiped clean. 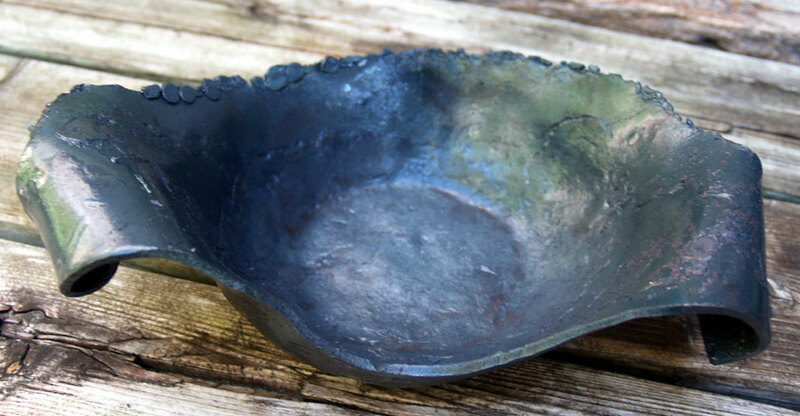 This results in subtle colour, mainly caught in the lines and forge marks. Also seen with the Bloomery Iron objects. 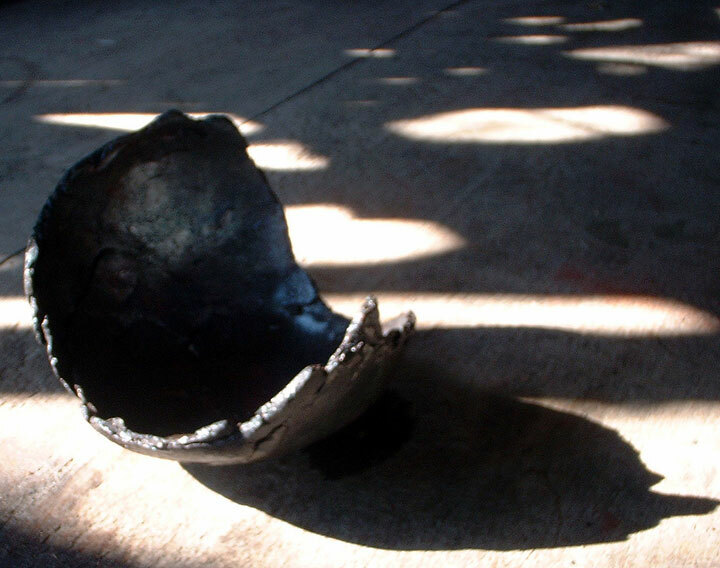 'Offering Bowl' is forged from part of the 'Resurection' Bloom made at in 2005. 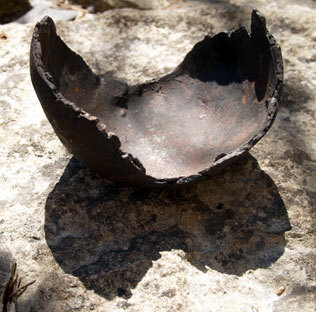 I envisioned creating a bowl like form that was soild in the centre but preserved the ragged edges of the natural bloom along the margins. Fragments of the bloom were welded into a thin plate, roughly 8 inches long by about 4 wide and roughly 1/8 thick. 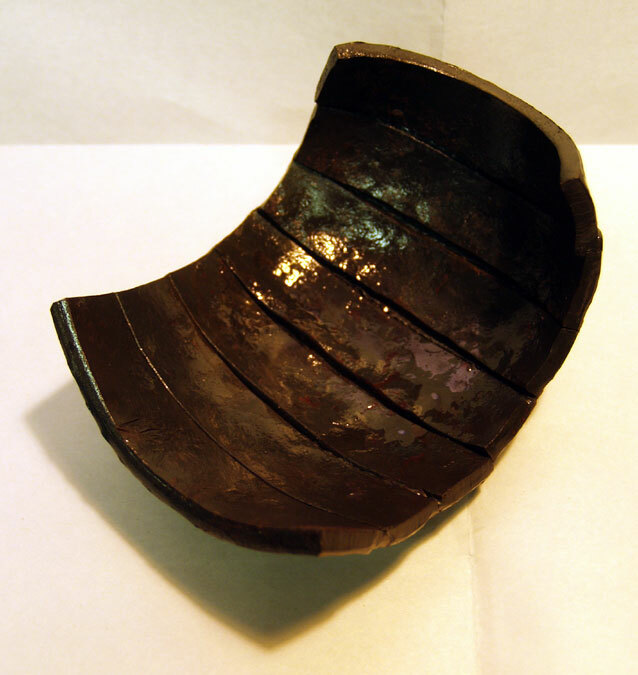 There was some splintering and cracking in the centre of the plate, specifically retained to show the origins of the material. 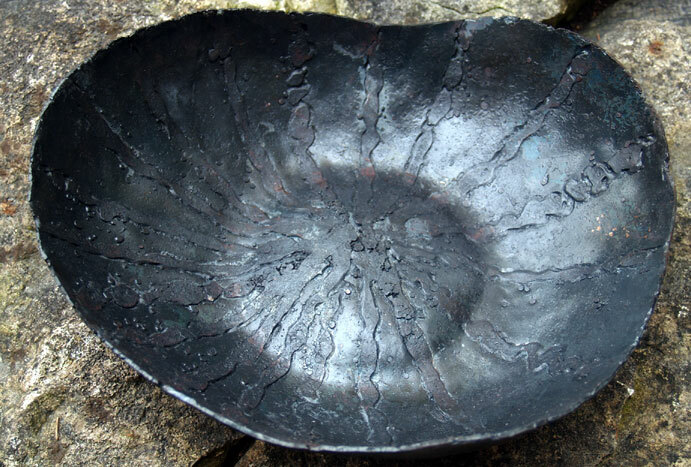 The plate was forged with ball peens into a deep dishing form. This created the final partial sphere shape. The parent bloom was created at the 2005 Smeltfest event. 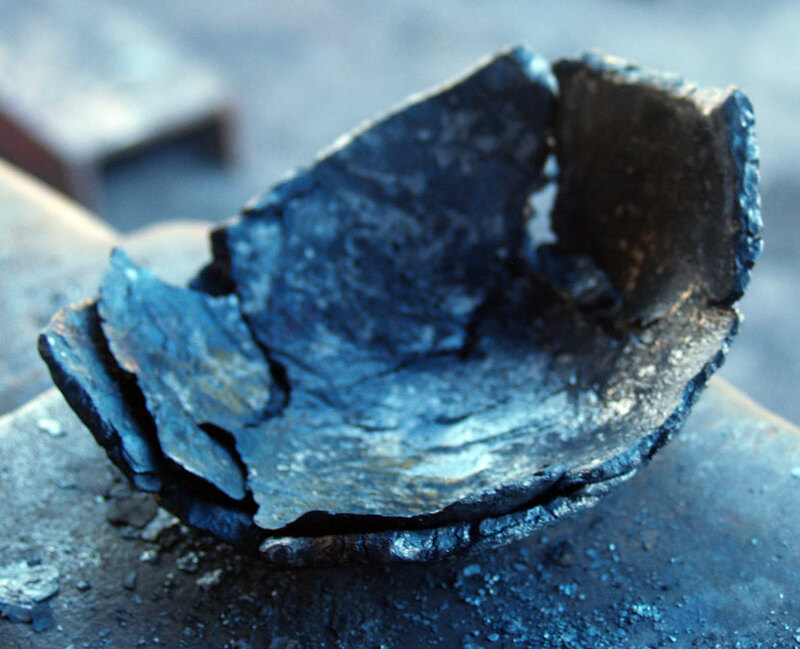 The metal itself was made from ore smelted using a direct reduction furnace based on those from the Viking Age. The original bloom mass was quartered by hot cutting. This section was flattened under the air hammer, working at welding temperature. Only one compaction series was undertaken, intentionally to allow cracks and fissures to develop along the margins of the plate. 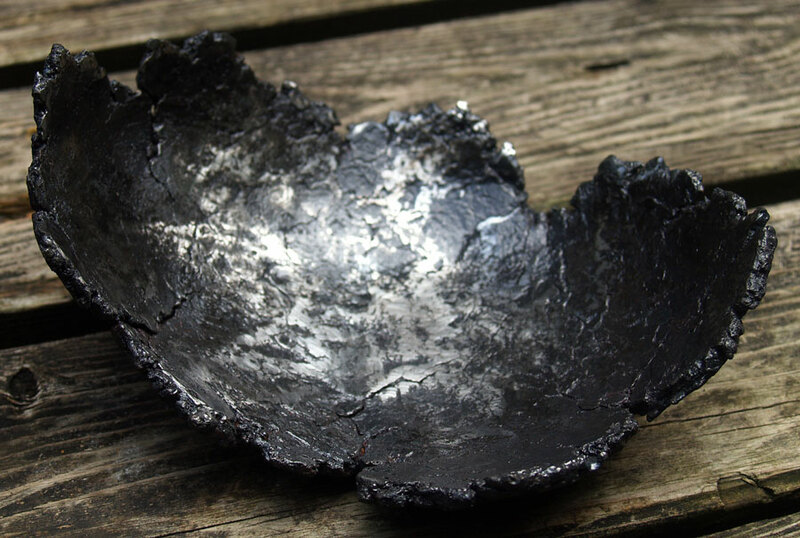 The roughly rectangular plate was then dished hot to create the bowl's shape. The inner surface was roughly polished with a flap sanding disk. The outer surface was given a fast wire brush to remove any loose scale. To finish, the piece was sealed with a spray matte varathane. The parent bloom was created as part of the Turf to Tools 1 project at the Scottish Sculpture Workshop (Lumsden, Scotland). The forge set up and equipment at SSW was at best mininmal. As well, the coal available was not the best (high sulphur content). As a result, the forge weld from the original consolodation compaction and fold was not as secure as I had hoped. 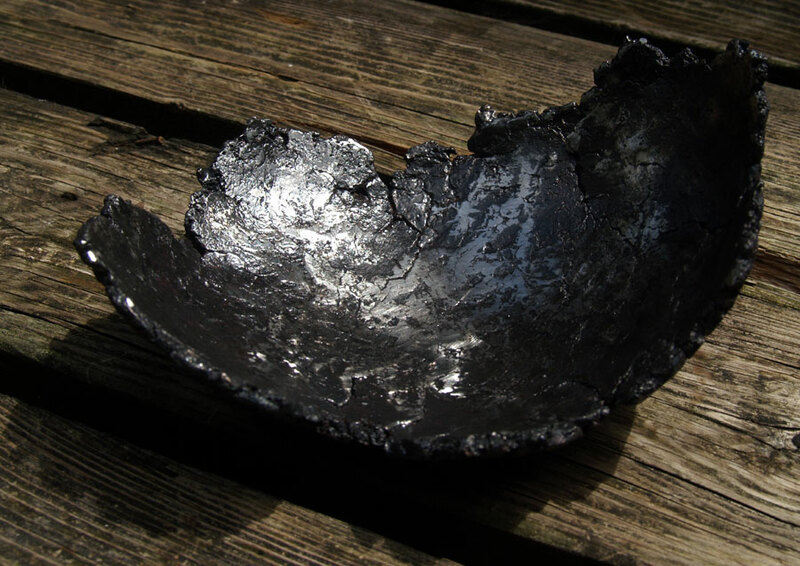 In the end this resulted in the 'double layer' effect during the dishing phase of the forging. The starting iron bloom was produced in smelt #24, June 2007. The hemi-spherical mass was first flattened to a plate, with the ragged edges and textures of the parent bloom retained. For a full description of the complex creation process of this object, see the blog post.